You may add as many email address as you have. 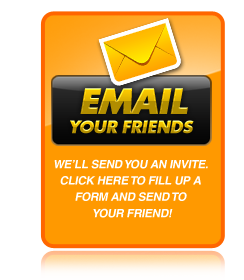 Your friends will receive an auto invitation email with his/her welcome bonuses! Once they sign up, deposit and play, sit back and wait for your rewards. First Name * Where do you want the bonus to be credited ? You have successfully sent the invitation email to your friends. 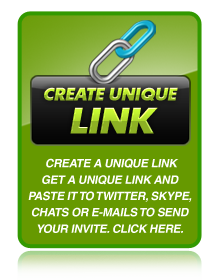 Share this personalized link on forums, Twitter, Skype, instant messenger & more. The more friends who clicked on this link the more free rewards you will get. Where do you want the bonus to be credited ? Make sure to type your 12BET.com username correctly. Copy and paste the link anywhere you like, Twitter, Skype, Youtube, chats and even in your email. Enjoy your cash flow. 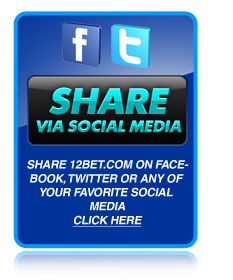 Share 12BET.com on your Facebook wall, Twitter page and other. This promotion is open for all 12BET active account holders from INDIA and using INR or USD currency only (deposit & bet during promotion period). To qualify as a Referring Member, you must be an existing 12BET member and placed ONE settled bet since registration of your account. To qualify for your referral bonus, your new “Friends” must register and make a minimum deposit of INR1,280 (USD20) within 10 days upon registered date. For this promotion, any referral who already hold an account with 12BET are considered to be existing members and will not eligible for this promotion. Your referral bonuses 15% (Per Successful Referral) will be credited into your account, when your referred friend meets the qualifying requirements. Every participant may refer his/her friends and acquaintances. Close relatives of the referrer (parents, siblings, children), persons living in the same household as the referrer, and persons giving the same e-mail address as the referrer or using the same deposit account (e.g. debit or credit card, e-wallet, mobile payment, etc) and shared computer (E.g school, public library or workplace, etc) as the referrer will NOT be accepted as new members. All referral bonuses must be used within 90 Days after the bonus is being credited into respective accounts. The referral bonus is subject to (1 time rollover) requirement before the next withdrawal can be made. 14-16 Nelson Street, Douglas, Isle of Man IM1 2AL. License granted 10th August, 2010. Online gaming is regulated by the Isle of Man Gambling Supervision Commission. for the Cagayan Economic Zone Authority of the Philippine Government. Copyright 2013, Pacific Sea Invests S. A. All Rights Reserved.